The United States Congress designated the Kanab Creek Wilderness (map) in 1984 and it now has a total of 68,231 acres. All of this wilderness is located in Arizona and is managed by the Bureau of Land Management and the Forest Service. One of the major tributaries of the Colorado River, Kanab Creek is the largest tributary canyon system on the north side of the Grand Canyon. From its origin about 50 miles north in southern Utah, Kanab Creek and its feeder streams have cut a network of gorges with vertical walls deep into the Kanab and Kaibab Plateaus. Above the canyon rims, the land is arid and the vegetation sparse, consisting mostly of desert shrub blackbush and sagebrush. In the creek bottom you'll find walls sculpted by wind and water into a maze of fins, knobs, and potholes, surrounded by riparian vegetation. Elevations range from 2,000 feet at the river to about 6,000 feet on the rim, and snow often falls in winter. Annual precipitation for this wilderness is 18.8 inches. Most of the slopes are angled in excess of 40 degrees. The upper reaches provide winter range for large Kaibab mule deer, and desert bighorn sheep dwell on the canyon cliffs. Almost all of Arizona's chukar partridges live here along with many smaller mammals, toads, frogs, lizards, snakes, and birds. Multiple trails access the Wilderness. Most visitors utilize trailheads originating on the east side of the Wilderness, since road access on the west side is poor. Hiking can be arduous. Trail systems are minimally maintained and conditions vary from year to year. 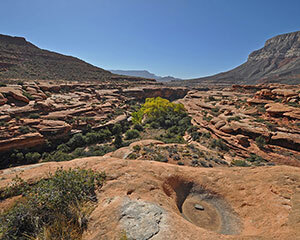 There is a total of 91.2 miles of trail in the Kanab Creek Wilderness, which includes wash bottoms connecting trail segments, but not known canyoneering routes. Spring and fall are the optimal seasons of the year for utilizing the area. Summer visitation is not recommended. Summer temperatures can easily reach 120 degrees Fahrenheit and permanent water sources are restricted to several springs and seeps creating hazardous conditions for hikers. More common conditions consists of average temperatures in the high 80s in summer and low 20s in mid-winter. Spring and fall temperature are more moderate. Special consideration should be given to the location and availability of water when planning an extended trip into this wilderness, during any season. Kanab Creek does not flow year round and obtaining drinking water from the creek is not advised. Planning to Visit the Kanab Creek Wilderness? How to follow the seven standard Leave No Trace principles differs in different parts of the country (desert vs. Rocky Mountains). Click on any of the principles listed below to learn more about how they apply in the Kanab Creek Wilderness.